Come and discover one of the largest and most endangered flying birds of North America. California Condors are radio tracked from Hi Mountain Lookout, flying near release sites in Big Sur and Pinnacles National Park in Central California and Bitter Creek National Wildlife Refuge, the Sespe Condor Sanctuary, and Hopper Mountain National Wildlife Refuge in Southern California. This is an opportunity for you to learn more about condor biology and the reintroduction of these magnificent birds back to the wild. 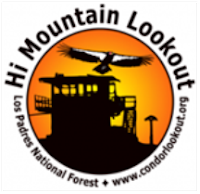 The Hi Mountain Lookout Project is a collaboration between Morro Coast Audubon Society, U.S. Forest Service at Los Padres National Forest, U.S. Fish &Wildlife Service California Condor Recovery Program, Cal Poly Biological Sciences Department, Ventana Wildlife Society, and Pinnacles National Park. Hi Mountain Lookout has been restored as a biological field research station and visitor center. Tour the interpretive visitor center with condor and other local wildlife displays and an extensive collection of local natural history references. Meet and socialize with our staff and community volunteers. Cal Poly student interns will discuss their ongoing field research projects in the Hi Mountain area, including small mammal live trapping, bird surveys, and vegetation analysis. The open house schedule includes condor radio tracking demonstrations, native plant identification, bird watching field trip, and a local geology walking stroll. Bring a picnic lunch at noon. Families with children are welcome. For those staying until the sunset watch, a potluck dinner is followed by evening speakers. Overnight camping sites are available at ‘Cypress Hill’ near the lookout or at the USFS Hi Mountain Campground one mile down the road. For driving directions and other information go to www.condorlookout.org. Visit the Hi Mountain Lookout Facebook page at www.facebook.com/condorlookout/. To RSVP for the event please call Steve Schubert at (805) 440-9390, or e-mail at s_schub1@msn.com.